Demand dropped but the budget carrier is still on track to meet its annual forecasts. EasyJet is set to weather the storm following a ‘fall-off in demand’ after the terror attacks in Paris in November and the Russian airliner brought down in an apparent terror attack in Egypt. A recovery in bookings and ticket prices put it on track to meet annual forecasts despite a 3.7% drop in revenue per seat in the three months to December. As predicted when it announced record full-year profits back in November, the knock-on effect of the tragedies has been significant – both Paris and Sharm el Sheikh are important destinations for the airline. Back in November, it had warned passengers they were likely to face longer waits due to heightened security in the aftermath of the Paris attacks. Flights were suspended to Sharm el Sheikh; some 5,000 passengers had been booked onto flights which were called off due to ongoing security concerns. The effect is an ongoing one too as easyJet has already said it wouldn’t resume the Egypt flights until 27 May at the earliest. Total revenues for the three months fell 0.1% despite an increase in passengers – up 8.1% to 16.1m. 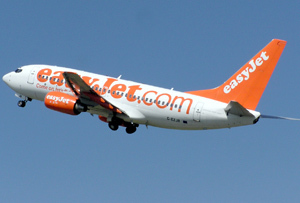 EasyJet still expects to meet market forecasts (pre-tax profit of £738m) for the full financial year to September 30 though – boosted by a lower fuel bill. Chief exec Carolyn McCall said the firm’s ‘excellent customer proposition combined with low oil prices’ has allowed it to offer lower fares, driving an 8% increase in passenger numbers in the first quarter. While investor sentiment remained uneasy following the update – shares initially dropped 3.4% this morning but crept up a little to a 1% fall – it's worth keeping a bit of perspective. McCall has, after all, overseen a soar in share price since taking the reins, quadrupling the firm's value since she became CEO nearly six years ago. Keeping things broadly on track in spite of such black swan events should leave its investors feeling pretty sweet.